Across America, jazz artists are exploding onto the popular music scene. Innovative cross-genre collaborations and multi-instrumentalist producers are blowing jazz’s stuffy musical reputation out the water, making way for an undefinable, electrifying musical sound. Photo: William P. Gottlieb. Flickr via The Library of Congress. Toni Morrison’s lyrical prose takes the reader on a journey through improvisation: the doo-wop rhythms of jazz and blues and the disjointed stop-start of a jazz score. Written in 1992, her novel Jazz positions America’s greatest musical legacy as a channel back into America of the 1920s when Lenox Street, Harlem was the epicentre of a flourishing African-American culture. Known as The Harlem Renaissance, it marked the birth of musical genre rooted in the collective experience of an oppressed people and their haphazard migration, escaping the cruel laws of a Jim Crow South for emancipation in the northern cities. Jazz music became an expression of a wild, free-flowing freedom, an assertion of the African-American identity. In the grip of untamed jazz rhythms, Morrison’s New York is a dark and sultry place: under the sway of moaning trumpets and groaning saxophones, beating to a frenzied pulse that dominates its citizens’ desires and dreams. Fast-forward to modern day New York and it is abundantly clear that the needle is turning once again through records of the jazz variety, thanks to an explosion of contemporary jazz musicians who are grooving a new track into the popular music zeitgeist of today. The Epic album cover. 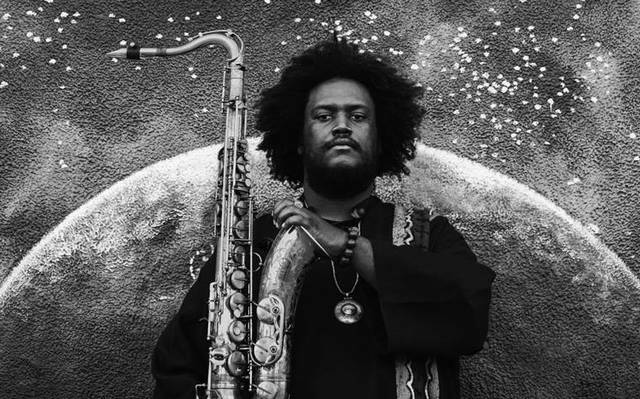 Photo: Kamasi Washington. Morrison writes about a "city seeping music that begged and challenged each and every day." No other act begs and challenges its audience more than the jazz group Onyx Collective; an amorphous collection of experimental musicians whose unpredictable, genre-defying performances and elusive concerts have earned their reputation as one of New York’s best talents. But what is unique about Onyx Collective is their evocation of the city. New York’s lifeblood runs through their album which listens as a sonic journey around the Lower East side, led by the blistering saxophone of the group’s founder, Isiah Barr. Barr speaks of their EP as a 'roadmap.' Indeed, New York’s streets feature in the track names of their latest EP: 2nd Avenue Rundown and 172 Forsyth Street – a reference to the radio station where Barr synthesized the collective. At times, their songs are jerky, hesitating – compared by Pitchfork critique Jay Balfour to the stop-start of the city’s traffic. Other times, their sound is almost old-fashioned with twinkling jazzy notes falling over trickling, relaxed beats. There is no denying the titillating improvisation of their unbound, progressive music – snapped up by the likes of singer Nick Hakim and rapper Princess Nokia. Signed with Big Dada records (parented by industry giant Ninja Tunes), Onyx Collective now tour with saxophonist Kamasi Washington. Arguably the biggest name in jazz today since his seminal album The Epic released in 2015, Washington is just one of a string of West Coast producers collaborating with jazz prodigies emerging out of the northern cities. Involved in a mind-blowing number of creative projects, this intricate web of musical innovators includes Madlib, Thundercat and Flying Lotus working alongside jazzmen such as Terrace Martin and Robert Glasper. Multi-instrumentalist Martin has produced rap anthems for Snoop Dogg and Kendrick Lamar, as well his own smooth masterpiece Velvet Portraits. Weaving together jazz and rap seems natural - one needs only to look at the musical heritage of California based producer Madlib. Son of soul singer Otis Jackson Senior and nephew of jazz trumpeter Jon Faddis, Madlib redefined instrumental hip-hop, producing J Dilla’s Donuts in addition to A Tribe Called Quest’s pioneering sounds and Erykah Badu’s smoky soul music. In 2003 Madlib created Shades of Blue, remixing timeless jazz tracks from Blue Notes Records. The result is an unmissable jazz-rap record that makes for perennial listening. This is a generation of talent who have rocketed eclectic music into vogue. Miles Davis. The trumpeter was credited by many critics with broadening the appeal of modern jazz more than any other performer of his era. Photo: Don Hunstein ©Sony BMG. Of course, combining jazz with hip-hop is nothing new. It has been done since the 80s, with rappers sampling funk, soul and jazz on their tracks. But this generation of jazz-fusion talent have been raised on a steady diet of hip-hop. Rap is in their blood while their formal training is in jazz. As Washington puts it, “We are as fluent in J Dilla and Dr Dre as we are in Mingus and Coltrane.” Take LA producer Flying Lotus. Alice Coltrane’s spiritual jazz has woven its way through the ether and into his music with the sporadic, otherworldly chiming of the harp in his album Cosmogramma. Flying Lotus subsequently founded Brainfeeder, the label with whom Kamasi Washington is signed today. Crucially, both jazz and hip-hop are inherently African-American art forms. This jazz renaissance signifies a culture of musicians aware and fiercely proud of their heritage but seeking new ways to push forward into an improvised, undefined musical future. Their music articulates a cross-roads in American musical tradition. And victory is theirs, with Kendrick Lamar cinching this year’s Pulitzer prize for music. Ground-breaking, firstly because this marks the formal recognition of hip-hop as an art form – prior to this, the voices of cynics could be heard muttering. Secondly, Lamar’s 2015 album To Pimp a Butterfly was a cross-genre collaboration that accelerated jazz into the popular, mass-record selling realm. Produced by Flying Lotus, featuring jazz pianist Robert Glasper, Terrace Martin and Kamasi Washington’s revered saxophone, it was hailed as a perfect fusion of two African-American musical styles. To Pimp a Butterfly album cover. Photo: Kendrick Lamar. 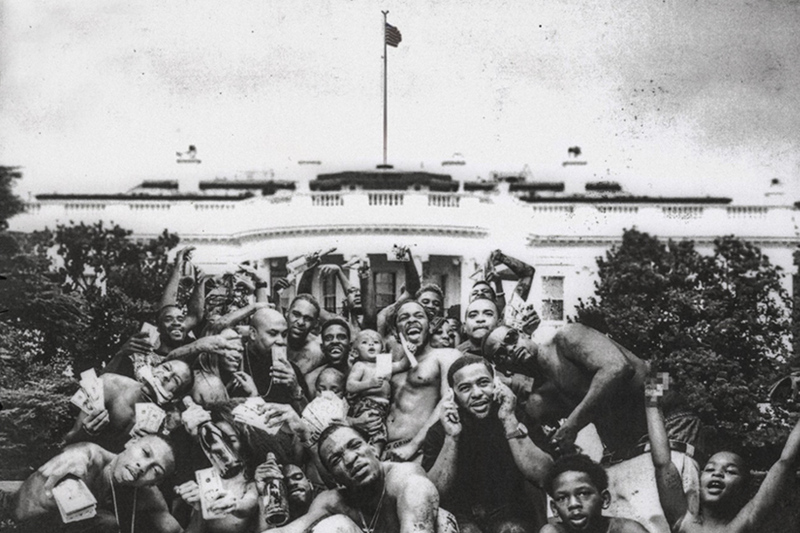 Kendrick Lamar’s powerful lyrics acquire added poignancy in the context of Black Lives Matter. A beacon of African-American pride, in ‘Blacker the Berry’ Lamar openly attacks white supremacy: ‘you hate my people, your plan is to exterminate my culture.’ He then turns his inflammatory speech upon himself, criticizing his own hypocrisy. It is a sobering recall of the dark place hip-hop stems from, the gang warfare and violence. Lamar names Trayvon Martin, weeping over the young African-American man whose death became a symbol of the systemic racial violence against African-Americans in the USA. It is undeniably a protest art-form as much as it is a musical revelation. In a blatant state of the nation address, Lamar goes so far as to sample the voice of Fox news’ Geraldo Rivera saying “hip hop music has done more damage to young African-Americans than racism.” Lamar’s intensely ironic re-appropriation that heightens the absurdity of this scantily fact-checked news channel. Scrutinising the politics behind the creation of such music is unavoidable. If jazz was the music of an oppressed, marginalised people, today’s fusion of jazz and hip-hop is a bold reassertion of liberty. It is a sonic movement that has gathered national momentum and burst forth from the golden mouthpiece of its saxophone touting leaders. Robert Glasper and Erykah Badu have recovered Miles Davis’ jazz classic "So Long" and their "Afro Blue" collaboration is an explicit, if not beautiful nod to their shared African-American heritage. In a musical tribute to the legacy left behind by rap icon J Dilla, experimental pianist Glasper spun his musical magic and created ‘J Dillalude.’ Jazz and hip-hop’s symbiosis has given birth to a tidal wave of creativity, stimulated by jazz’s free flowing improvisation and hip-hop’s repetitive, wonkily slung beat. No artist better encapsulates this than Jamaican-American artist Masego, who mixes house-inspired beats with rap vocals and live saxophone performances to produce his own genre: TrapHouseJazz. This culture of musical innovation has stripped jazz of its beard-stroking, cigar-smoking typecast and accelerated jazz into the musical mainstream. Jazz’s nostalgia has been flipped on its head. Now the oozing blues of its trumpets wear the high-hats of avant-garde, progressive playing. Just as Toni Morrison wrote Jazz in the nineties about 1920s America, jazz’s resurgence signifies a timeless musical genre that is universally understood as much today as it was at inception. It is bold, unapologetic expression of community written in a communal yet constantly-evolving language. Influential in its innovation, jazz music has crossed the seas, imprinting the American musical tradition into the DNA of other world music. In the same way that it is a tool of desegregation, jazz itself is inseparable from the other musical genres it mutually informs. And today it is politically aware, improvising, genre-blending musical visionaries who are spearheading the jazz renaissance. To steal Nicholas Payton’s throw-it-all-together musical mantra, "Jazz Is a Four Letter Word."